This week I went to the museum of art history (Kunsthistorisches Museum) to spend an hour with my favorite pieces. In the morning hours, when the tourists are not yet out in full force, it is wonderful to stroll through the museums vast halls, practically alone, the only sound being my own footsteps on the parquet, surrounded by beauty and a feeling of centuries stretching out behind me, history in the very air I breathe. I have always been drawn more to sculptures and objects of design that fuse art and functionality (at least theoretically) than to paintings. I can spend a long time staring entranced at the objects in the Kunstkammer (a word even the museum refuses to translate, it names the heart of the museum’s collections of art objects made under the Hapsburg reign). In the Kunstkammer you can see the most intricately made sculptures, furniture, tapestries, dishes and objects for daily use (even pefume bottles!) that made the artisans of Austria’s empire famous the world over. 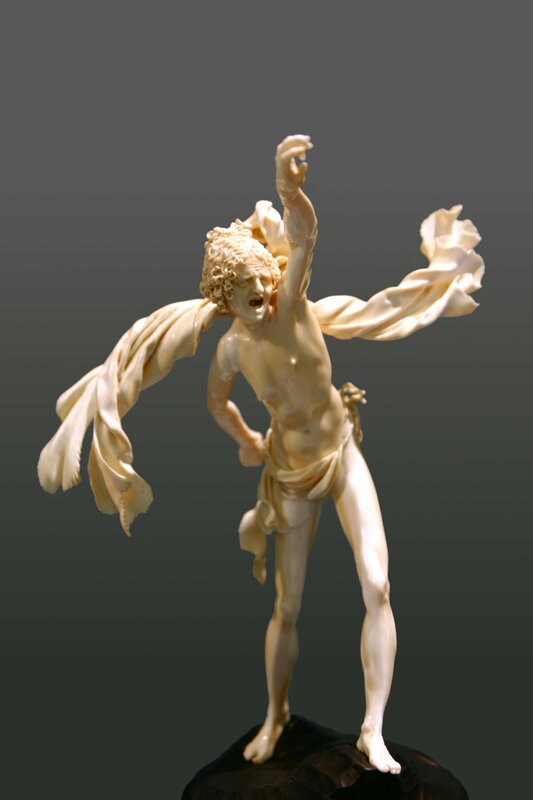 One particular exhibit of the Kunstkammer that never fail to impress me is the work of an unknown artist active in the early 17th century, the so called Furienmeister (Master of the Furies). His ivory sculptures are breathtaking. 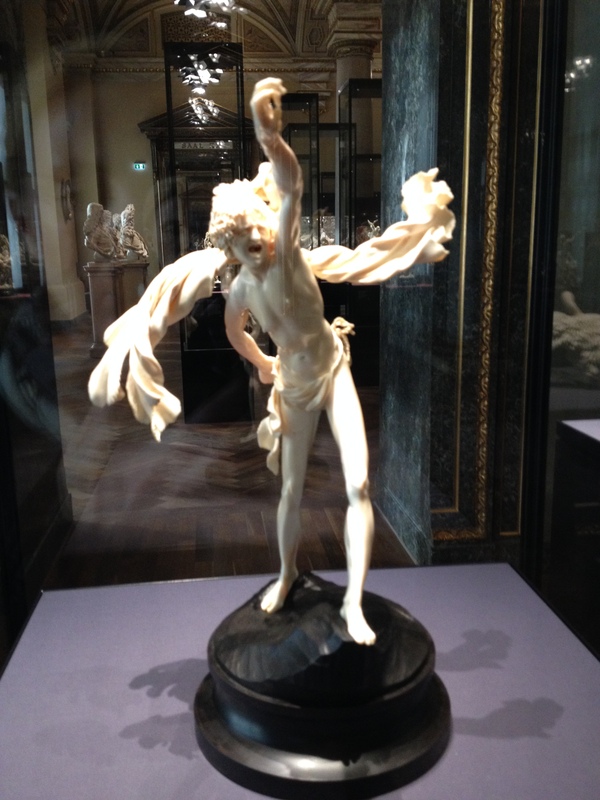 My favorite is the Fury, an androgynous figure of an enraged fury in full movement. The sculpture is incredibly dynamic, but what really gets to me is the face and the hand. So intricately made, so bewitching in its expression, I alway end up spending most of my time in front of it and coming back for a last look at the end of each visit. The Fury is the work of art that touches me the most, equally drawing me in and repelling me, for reasons I cannot quite fathom, nor do I want to. Some things are best left unanalyzed and just to be enjoyed. 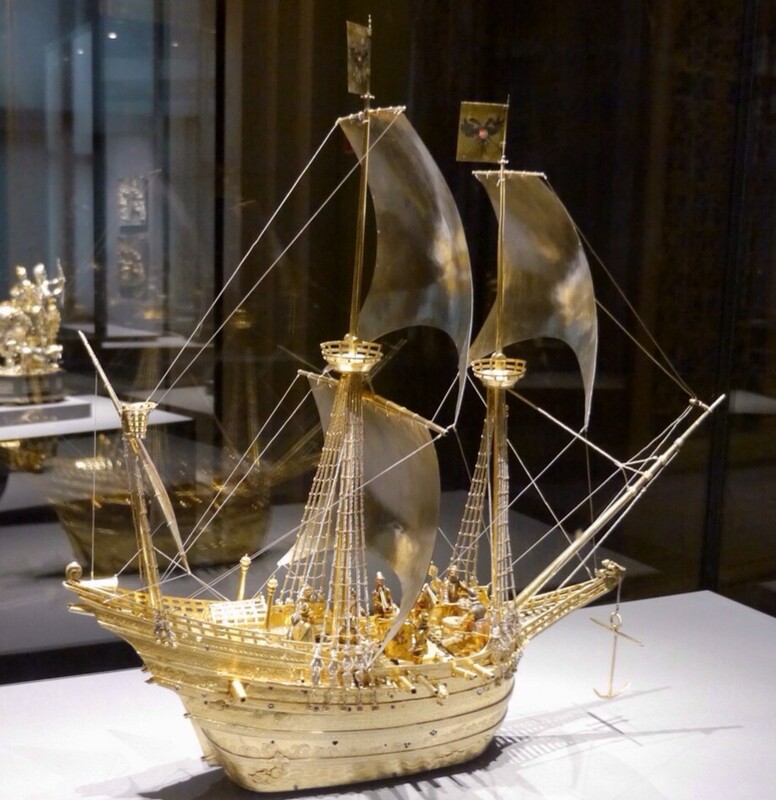 Another amazing thing is this ship of pure gold, it is my older son’s favorite. 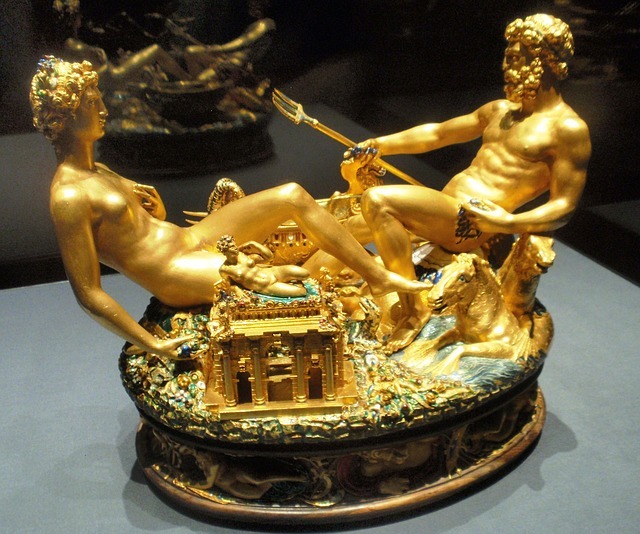 The Saliera by Benvenuto Cellini is definitely the most famous salt dish in history. It came to even more fame when it was stolen from the museum by an amateur thief in 2003 who kept it under his bed for almost three years before the police got too close for comfort and he decided to give himself up and the Saliera was returned to the museum (who had a vertiable publicity debacle on their hands). 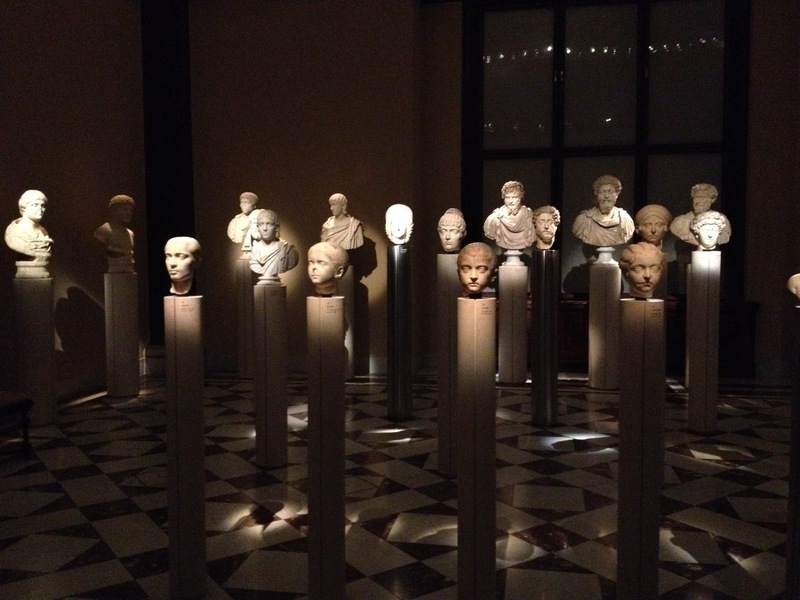 This is the creepiest room in the classics collection. Heads on sticks in eerie lightning – it looks just fabulous and you can’t walk this room without a shiver down your spine. 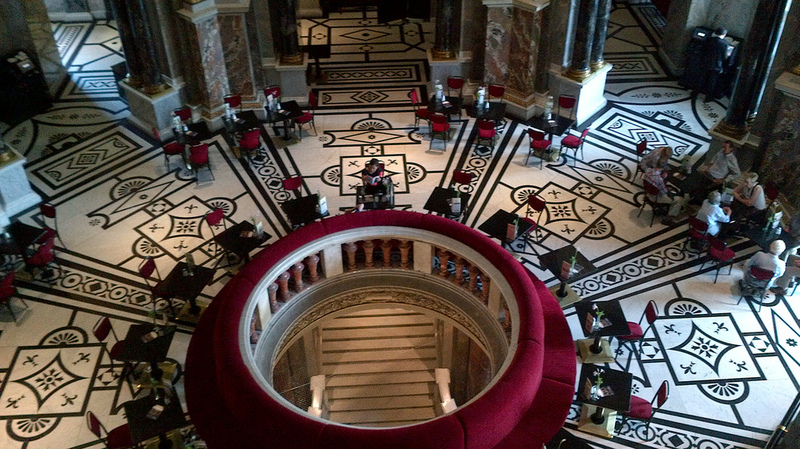 This is a snapshot of the café at the KHM from above, there are not many places where you can get a coffee and a pastry in greater style, I love it there. I think we are extremely lucky here in Vienna to have such amazing works of art on permanent exhibition. 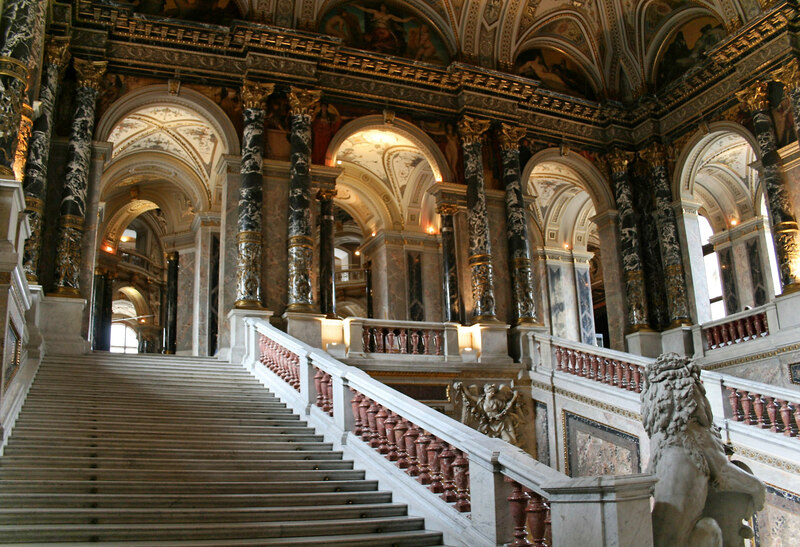 If you come to visit the city, make the Kunsthistorisches Museum your first stop! What is the piece of art that touches you? This entry was posted in Art, Vienna and tagged Art, Bruegel, Fury, Kunsthistorisches Museum Wien, Museum, Vienna. Bookmark the permalink. What a great painting, it makes me smile too. Thanks for the link! That is a wonderful painting indeed. And the MoMA, sigh… I love it there. I love the KHM – I always relax among so much “concentrated” beauty. If I had to pick I’d take the old Dutch paintings. Concentrated beauty is right, it is like an infusion. 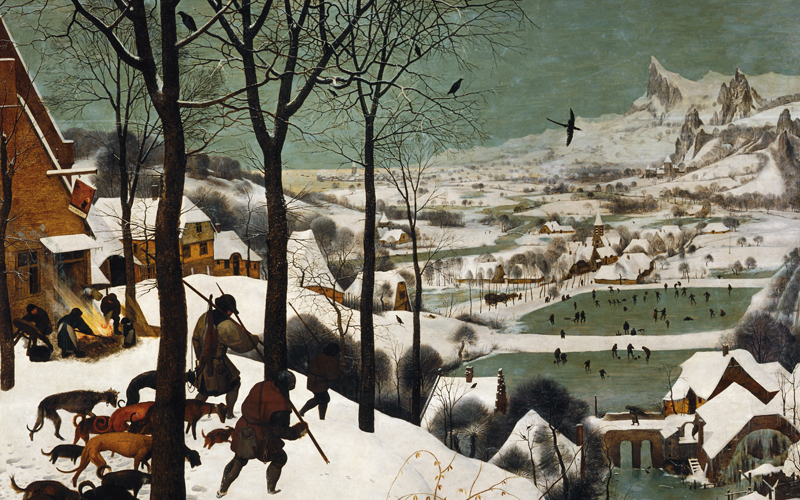 That Breughel painting is very nostalgic for me – the first one (reproduction, obvs!) I bought for my first house in Stafford. 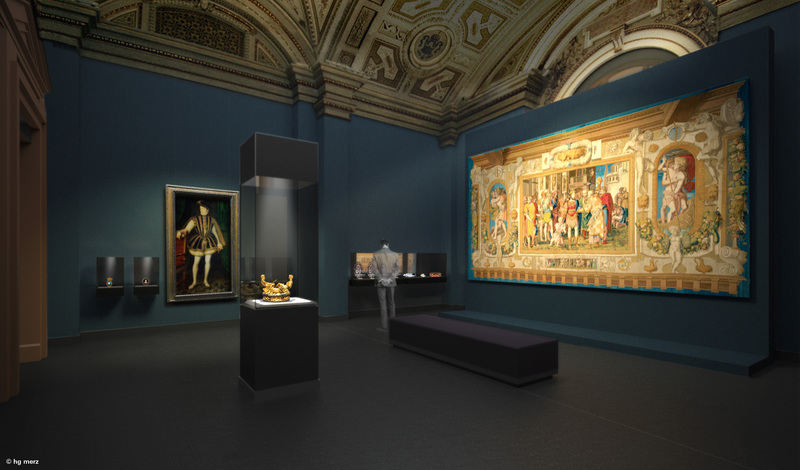 This sounds rather like our Victoria and Albert Museum, B. Wonderful. Vienna has such a wealth of cultural exhibits. The Fury is so dynamic and that salt dish is something else! This is making me even more excited for my forthcoming visit. Portia has also recommended the Wren and Belvedere galleries. Not sure where Portia was, but I am not aware of a Wren gallery in Vienna. 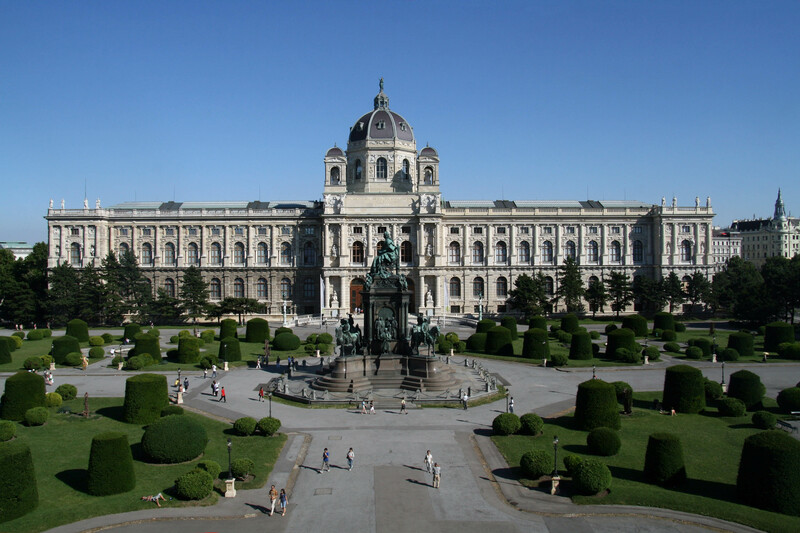 But we’ll do the grand tour of KHM, Albertina, MuMoK and Belvedere – if you want to that is. Oh I definitely want to! Thanks, B.
I loved the KHM, especially the wonderful enamels (the Hapsburgs certainly loved enamel!). It’s hard to say especially, when there are so many treasures, some known, like Vermeer and the Cellini salt, but also others I’d never heard of that were absolutely enthralling. As to a piece of art that touches me, in the year I spent in Berlin, I spent many days in the Pergamon museum with the great altar (now, alas, closed until I think 2019). I work on Greek culture, and that altar is so amazing, so detailed, so complicated, one can stare at it forever. Hellenistic art is a bit over the top – flowing hair, anguished expressions, contorted limbs – but that’s part of the fun of it. I like over the top in cases like this, it must have been great being able to study the altar so closely. Happy to hear you have been to the KHM, Empliau! I also love the Kunstkammer, I remember spending a bit of time searching for the Vermeer ( my bucket list includes seeing all the known Vermeer paintings), but the architecture was so enthralling that I was constantly distracted. The staircase! The KHM is such a treasure trove. My breath is taken away when I walk through the doors – every time. Bernini’s sculptures move me to tears when I see them. My absolute favorite museum is the Louvre – I could get lost for days in there. I hope to have plenty of time for the Louvre on my next visit to Paris. The painting I love the most,is Ophelia,by Sir John Everett Millais.I was fortunate enough to spend about an hour in front of it’s magnifiscence,at the Tate Britain Gallery,when I was in the UK.Ophelia’s face is hauntingly beautiful,and I’ve always wondered what she would be thinking,lying there in the cold river stream,literally taking her last breath,surrounded by flowers.And what the scene would have smelled like?It’s breathtaking.My favorite art gallery though,is Manchester Art Gallery;purely for their gorgeous Dante Gabriel Rosetti collection.The detail to his subject’s crimson lips,and their hand gestures,are exquisite up close!Highly recommended if you’re ever in Manchester! Manchester, huh? Who would have thought?! I love the way you describe your favorite painting! Birgit,Manchester was a very interesting and surprising experience!I enjoyed such a variety of culture there,from watching a Football game at Old Trafford,visiting THE BIGGEST mall I’ve ever been to(Trafford Centre…WOWZERS!! ),to their museums and lush,green parks!Manchester Art Gallery and Tatton Park-an old Manor house,with gorgeous gardens and a labyrinth-were probably the two highlights.An experience I’ll never forget! I hope I get to go some day. That is indeed some creepy room, like shards of past avatars in continual motion….And he kept it under his bed?? What a hoot! I love museums. We only have one here, and it’s the size of your living room….sigh. Wonderful places for meditation and contemplation. VIENNA!! An excellent place to go art hunting. I love that you have the Belvedere basically as a Klimt museum, he is now one of Jin’s favourite artists too. I also enjoy the Vienna Museum Karlsplatz very much, the Designforum Wien, Vienna’s Museum of Modern Art MUMOK, and others. You have a plethora!! Favourite artist? I have a few. Gloria Petyarre is my favourite Australian artist, the ONLY Australian artist yet to do a scarf for Hermes. I also love Salvador Dali, Sidney Nolan, Roy Lichtenstein, Brett Whitely, Georgia O’Keeffe, Vincent Van Gogh, Edward Hopper…… So many Birgit. Next time I’m in Vienna I would LOVE to have a cuppa and a squiz at The Vienna Museum Of Art History, last time I was in there was 1995. Ah, Edward Hopper, I love him so! Next time when you are here we’ll go to the museums together! B, I’m guessing the Designforum Wien solves the mystery. Thanks for sharing this, Birgit! I think my favorite piece from your photos is the ship (that your son loves). It has such splendid details – and cast in gold, it speaks of the shiny, exciting feeling of travel and exploration. My favorite art works are all by the Danish artist Kay Nielsen, who worked mainly as an illustrator during the “golden age” of fairytale illustrations. I got to discovers Nielsen’s work though you, Suz and I’m grateful. Ooh ‘Fury’ is striking and a lot like the ‘kind’ of sculpture I am drawn. I love Bernini’s pieces especially those found inside churches like the ecstasy of St. Theresa and another one whose name I keep forgetting but keep meaning to post about (I will finish that post one day- lol). But the piece that touches me most is Michelangelo’s Pieta- the one at the Duomo in Florence. I think there were a lot of factors that contributed to making that sculpture special and meaningful – my grandfather had just passed away and it was off season so I got 15 full minutes alone with the sculpture. Wonderful! How lucky for you to have been alone with the Pieta for a while. It must be truly aweinspiring. I hope you do and soon! I have a soft spot for Durer’s Young Hare (at the Albertina). If I had to choose just one piece of art in the world, it would probably be it. Oh, I should return to Vienna! How fortunate you are to be able to visit that gorgeous museum as often as you wish! My favourite painting there is by Johann von “Name of a city,” I forget which one (Bremen?). It is a very small self-portrait of the artist with his wife, in his studio. It could almost be an iPhone selfie, except that it was painted 450 years ago. Every time I’m in your lovely city I go by the museum to visit him. Great to hear that you love Vienna too, I must go looking for that “selfie” next time I’m there.